Kiyomizu-dera is one of the Historic Monuments of Ancient Kyoto from the UNESCO World Heritage Site and one of the most famous places to visit in Kyoto. In English, Kiyomizu means clear water and dear means temple. I also heard that it is illuminated by night during certain periods in Fall and Spring, but I’ve never had the chance to see it. Must be pretty! This temple is not too far from Ginkaku-ji, so I would recommend you to visit both of them on the same day. Ginkaku-ji (or Temple of the Silver Pavilion) is one of the 17 Historic Monuments of Ancient Kyoto from the UNESCO World Heritage Site. Compared to the Temple of the Golden Pavilion, it feels less magnificent and more natural, but still beautiful. It features a sand garden where bees inhabit and a vast moss garden where it feels refreshing to walk during a hot Summer day (temperature can go up to a very humid 40ºC in Kyoto). One of the must-go-see spot in Kyoto! Kinkaku-ji (or Temple of the Golden Pavilion) is one of the 17 Historic Monuments of Ancient Kyoto from the UNESCO World Heritage Site. Having been there, I can understand why it attracts so many visitors (foreigners as well as Japanese people themselves) throughout the year. The temple itself is magnificent with its golden coating and it is surrounded by a stunningly beautiful lake and garden. There is a lot of truly great pictures of it on the Internet, but believe me that have to see it in real to understand how beautiful it truly is. I went there this Summer and took a few photos for you to see! Engaku-ji is one of the most important Zen Buddhist temple in Japan. It was founded in 1282 by Tokimune Hojo and is situated in Kita-Kamakura just near the railway station. This temple also ranks second amongst the five great Rinzai temples of Kamakura (鎌倉五山). Shisouan (梓想庵) is a service that let you borrow traditional samurai clothes from the Kamakura period and induce yourself into the atmosphere of the Kamakura area. Of course, katana are also included and you can even try Japanese archery (kyudo). You can also check out their blog if you want to see more photos. That’s how I looked after being transformed into a samurai. 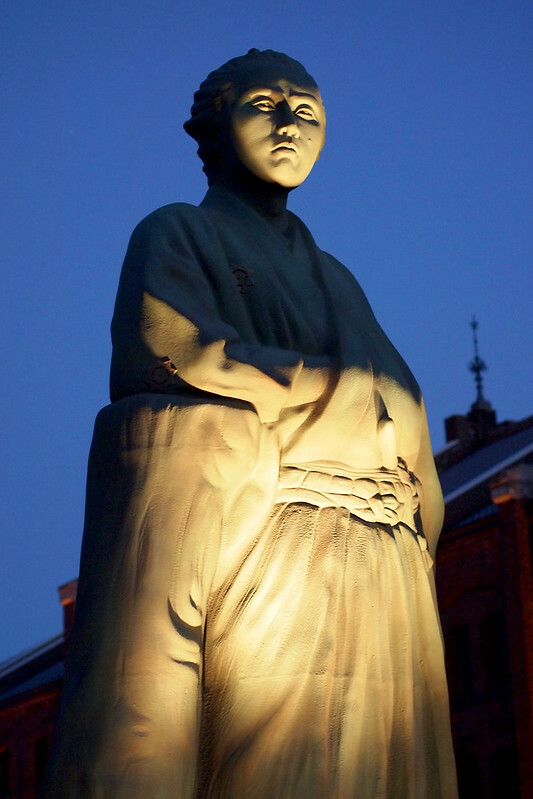 This statue of Sakamoto Ryōma was exposed at Minato-mirai in Yokohama a few weeks ago. Sakamoto Ryōma (坂本 龍馬) was an important figure during the Bakumatsu period and a leader of the movement to overthrow the Tokugawa shogunate. He was born in 1836 in the old Kōchi Prefecture and was assassinated in 1867 in Kyoto.